As disclosed in an agreement signed on 18 July 2018 at the Shanghai New International Expo Centre by the organisers of Texcare Asia and the China Laundry Expo, the two trade fairs will merge into a single show in a win-win arrangement to integrate industry resources. The new joint-venture fair will be the largest annual industry event covering the textile care and laundry chain in Asia. The first edition will take place in August 2019 at the Shanghai New International Expo Centre and will be jointly organised by the China Laundry Association and the China Light Machinery Association from the industry, as well as Messe Frankfurt (Shanghai) Co Ltd and Unifair Exhibition Service Co Ltd. 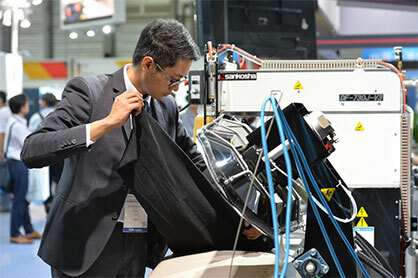 The annual China Laundry Expo was founded in 2000 and is held on a rotating basis between Beijing and Shanghai. Organised by the China Laundry Association and Unifair Exhibition Services Co Ltd, the show receives significant government and commercial sector backing. The 19th edition is held at the Shanghai New International Expo Centre over the next three days and will play host to more than 220 exhibitors representing around 500 brands from over 10 countries and regions. The fair is also expecting to welcome over 20,000 trade and industry visitors to an impressive 23,000 sqm of exhibition space. Key product categories of the China Laundry Expo include laundry equipment, accessories, chemicals, consumables, leather care products, energy-saving and environmental protection equipment, information-based intelligent products and solutions, and much more. Not only do these product categories cater to the purchasing demands of visitors around the globe, but the strong variety also serves to attract more suppliers and industry players. With a similar focus to the China Laundry Expo, Texcare Asia made its debut in Singapore in 1998 and was introduced to Hong Kong in 2002. The fair then moved to China in 2005 in Beijing and has been located in Shanghai since 2013. With the strong international network and industry support from the renowned mother fair, Texcare International, the China event is now recognised as one of the largest scale events for laundry equipment and related technologies in Asia. It has served as a biennial meeting point for textile care manufacturers, suppliers and professionals to network, trade, conduct business, and catch up with industry developments. The fair also holds a unique position as a platform for providers of textile rental services, training services for institutions, and machinery for the cleaning of carpets, floor coverings, upholstery and buildings. By combining product groups from the China Laundry Expo with those of Texcare Asia, the merged platform promises to deliver a comprehensive value added experience for its customers and visitors. The expanded product portfolio and merging of resources mean that the newly merged show is predicted to attract an impressive 300 exhibitors and 25,000 industry visitors across over 30,000 sqm of floor space when it opens its doors in August 2019. For further details, please visit http://www.texcare-asia.com, or contact texcareasia@china.messefrankfurt.com.